Another great book. This is an interesting read, but as the authors stated, there's no central theme so I don't have many conclude thoughts or ideas that it spurred. I enjoyed listening and contemplating the relevance and implications for the studies that Levitt did. I am contemplating do statistical analysis for a career, this book fit in with those interests. I did read this book though. I listened to it as an audiobook on my iPod from Audible. This is a very enjoyable means of taking in a book, especially while driving or cycling (I only listen on bike only trails, not roads). I did miss the opportunity to dog ear pages for reading again later, and it seemed harder to stop and contemplate the stories. I will certainly buy more audiobooks, or check themout from my library. Levitt, Steven D., and Stephen J. Dubner. 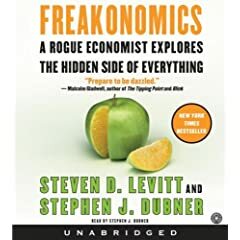 Freakonomics: A Rogue Economist the hidden side of everything. New York: William Morrow, 2005.